For the past six months or so I’ve been jonesing to knit a sweater. But I already have two drawers full of handknit sweaters, so I need another sweater like a need a hole in my head. But my son does have a lovely GF who adores hand knitted everything, so why not knit a sweater for her? I started pouring through pattern books and searching on Ravelry to find sweaters that would be contemporary but classic. I went through my stash to find yarn suitable for sweaters. And I thought and thought and thought some more. I have been inspired by Ravelry friends and by knitting podcasters, especially the Knitmore Girls, whose back catalog has been my spinning companion. Through these folks, I found some lovely sweater patterns that are now in my queue, but they are not on my needles. Yet. 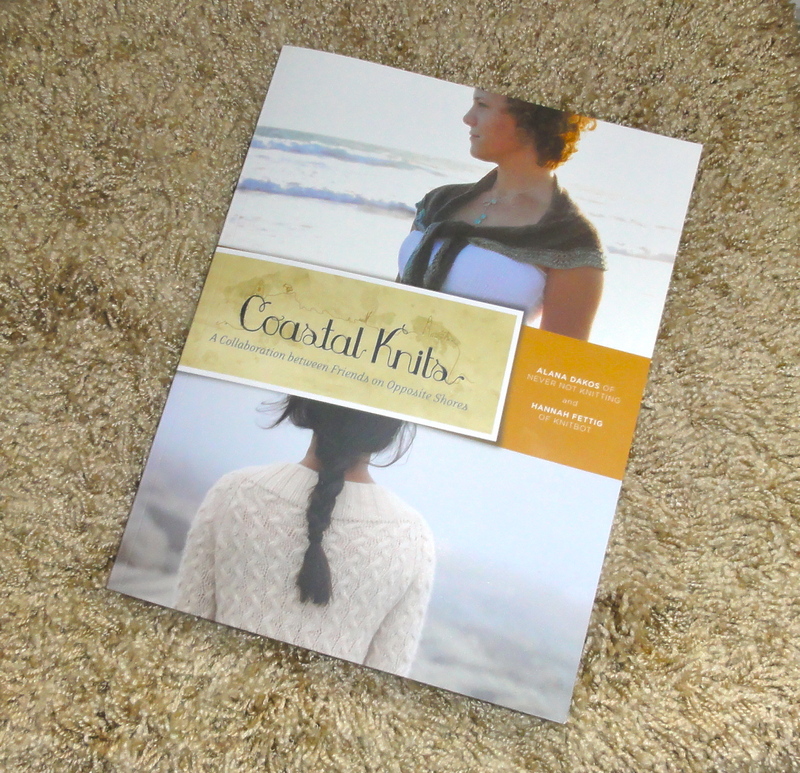 But more importantly, due to the recommendations of just about every knitting podcaster in existence, I decided to purchase a knitting book that everyone has been raving about, Coastal Knits. Let me state first that I rarely buy knitting books any more. Too many of them contain either poorly-thought-out projects that I would never even consider knitting or trendy stuff. I don’t do trendy. But this book is different. It is filled with patterns, mostly for sweaters, but also some for accessories, that are classic and very knitable. The sweaters come in a large range of sizes and have shaping that makes them feminine. And if you don’t want the entire book (and I cannot imagine why you wouldn’t), you can purchase the patterns individually as PDFs. When I got the book in my grubby little hands, I was so thrilled with it that I could barely contain my enthusiasm. The next time I saw the GF, I handed the book to her first thing and told her to take her time and go through it and choose any items that she would like me to make her. I allowed for the possibility that there might not be anything in the book she would want, but I knew the odds of that were somewhere between slim and none. And I was right. When I saw her a couple of months later, she said that she loved pretty much everything in the book, but the thing she wanted first was the Bayside Pullover. Next question–what size? That was answered quickly because she had been measured not all that long ago for a bridesmaid dress. Now comes the most important question. The sweater in the book is knitted in linen–Quince & Company Sparrow–but it can just as easily be knitted in wool or a wool blend. What fiber would she prefer? Her choice was linen. Now, let me state for the record that I knew that linen would present a challenge, but that would just make the project more interesting. And a sweater in linen would definitely be scrumptious. The next step was choosing and ordering yarn. I certainly don’t have sweater-quantities of linen yarn in my stash, just some leftover bits of Eurosport Linen that I knitted up into facecloths many years ago. I went to the Quince & Company web site and discovered to my delight that their linen yarn, Sparrow, is very well priced and comes in some lovely colors. I sent a link to the GF and asked her to choose the color she would like. She sent me three and asked me to choose, so I picked Nannyberry, a lovely dusky rose color. I placed my order, which was quickly filled, and when the yarn arrived, I was totally blown away by how beautiful it is. I couldn’t wait to knit it up. So I hand-wound a skein into a ball and started swatching. And here’s where the challenge of knitting a sweater in linen lies. For a lot of knitters, swatching is a dirty word, but when knitting a garment where size matters, it is essential. The swatch must be knitted, then laundered in the same way as the finished item will be laundered. Then the stitches and rows can be measured to determine the gauge. This is a step that should not be left out if you want the garment to be the size you intend. And this is especially true for a fiber like linen. 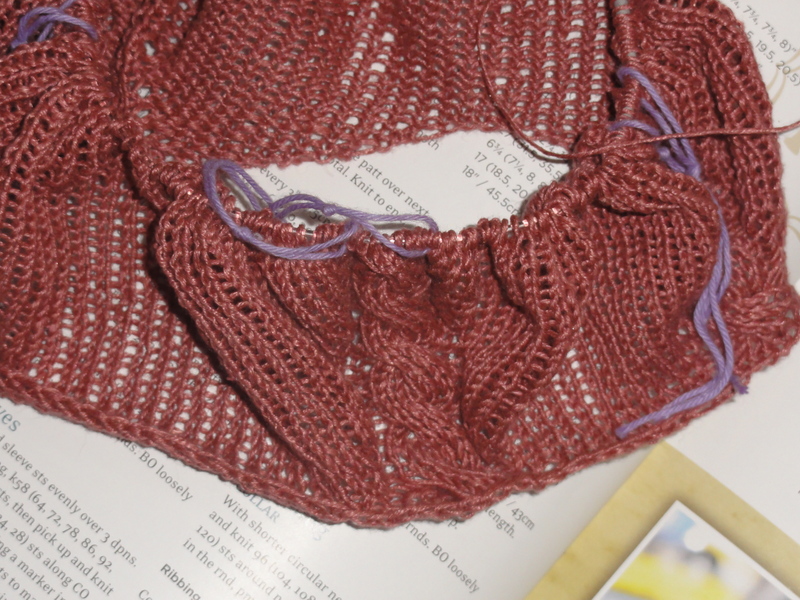 No matter what size needles I used for knitting the swatch, the unwashed gauge was 5 stitches per inch. The pattern calls for 6 stitches per inch. I couldn’t possibly know the gauge until after the swatch was washed and dried. After knitting and washing several swatches, I finally found the needle size that gave me 6 stitches per inch. We are a go! I was ever so eager to cast on, but something happened that made me put the sweater on hold for a little while longer. The NHLPA and the NHL reached an agreement and the hockey season was about to begin. I needed to have lots of mindless hockey knitting OTN, so I got busy casting on socks. The sweater would have to wait its turn. 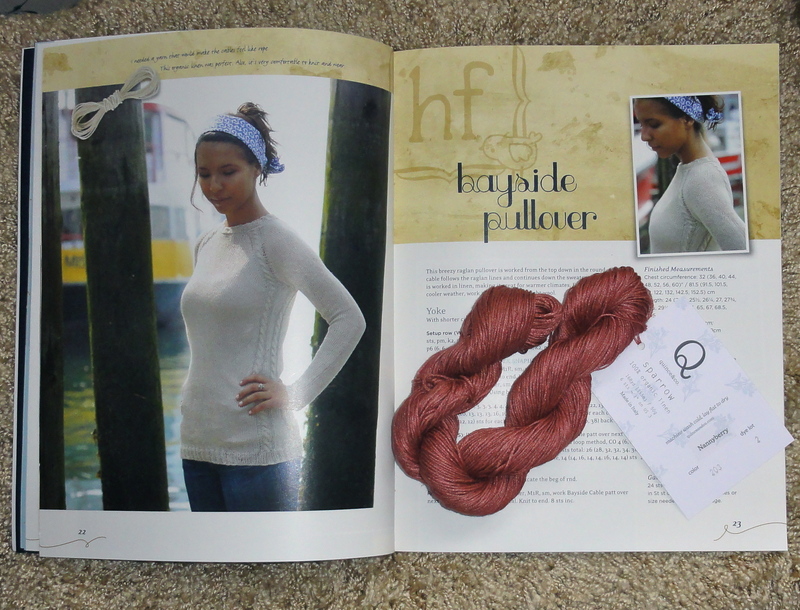 Finally, last Saturday, after the Penguins had demolished the Devils at the CEC, I finally cast on the Bayside Pullover. This pattern is a very simple one, a top-down raglan embellished with a simple 6-stitch cable, but the casting on takes some concentration and stitch counting. Once I got the pattern established, this sweater became mindless knitting that I can work on while watching hockey, so the knitting should go quickly. 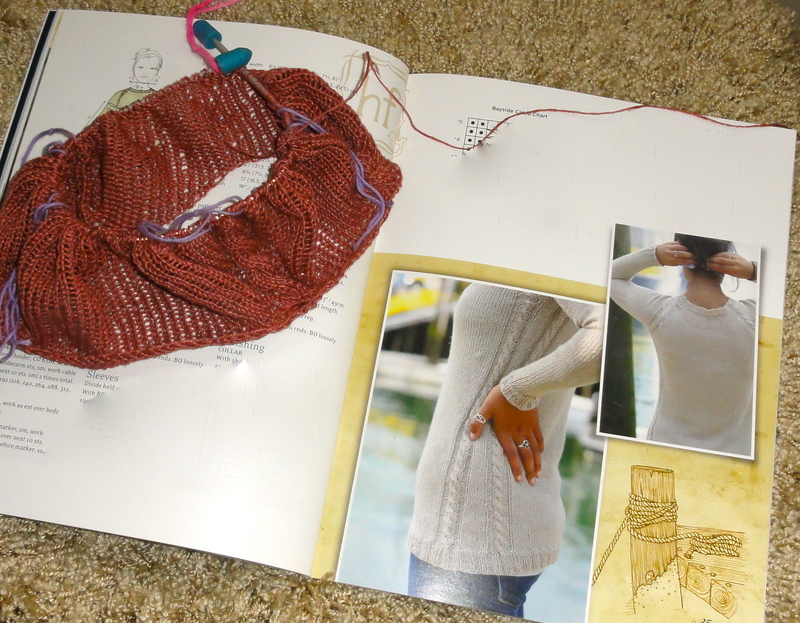 I hope to have the sweater finished in a few weeks so the it can be worn this spring. Side and back view. I obscured some of the text to protect the copyright. I’ve got three inches knitted so far. I’m very happy with both the pattern and the yarn. I just hope that when the dust settles, the sweater fits the wearer and lives up to her expectations. This entry was posted in Knitting, Sweaters and tagged Bayside Pullover, Coastal Knits, knitting and hockey, Pittsburgh Penguins, Quince & Company Sparrow, Ravelry, The Knitmore Girls, top-down raglan. Bookmark the permalink. There are wedding plans in the not too distant future, and I’m so looking forward to having this wonderful young woman as my daughter-in-law.